Though their occupations differ, Cambodian workers are united in their push for a living wage. Garment workers, teachers, and garbage collectors in Cambodia have launched a series of protest actions since December to demand substantial wage hikes and an improvement of their working conditions. 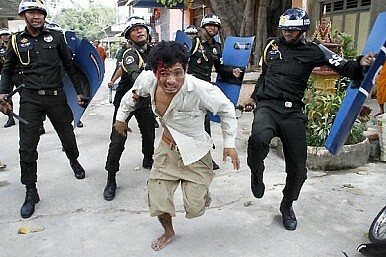 The strikes exposed Cambodia’s mounting labor woes and worsening political crisis. Garment workers conducted a nationwide strike last December to push for a monthly minimum wage of $160, the amount needed to survive in Cambodia based on an estimate provided by the government. Garment workers receive a monthly basic pay of $80. The garment sector is a $5 billion dollar export industry in Cambodia which employs more than 600,000 workers. The Ministry of Labor said the full wage demand can be granted only in 2018 and a $15 wage hike is more feasible today. Strikes erupted over the measly increase; and the striking workers were later joined by the opposition party which has rejected last year’s election results and has been mobilizing thousands for several months already to call for the ouster of Prime Minister Hun Sen. In response, the government agreed to a $100 minimum wage ($95 basic pay and $5 food allowance) to be implemented next month. But this was rejected by union leaders who vowed to hold more strikes and factory shutdowns. On January 3, the government ordered a crackdown on the strike. Police violently dispersed and arrested the striking workers. The protest camp of the opposition was also forcibly removed and public gatherings were banned in Phnom Penh, the country’s capital. As of February 14 the ban is still in effect after police invoked the policy when it denied a permit to the global One Billion Rising campaign. The protest crackdown resulted in the deaths of four people and the arrests of 23 workers and activists; 38 were hospitalized during the dispersal, with 25 suffering from bullet wounds. The strike by garment workers probably inspired teachers to demand a monthly pay of $250 after many teachers complained that they only receive $75 each month. According to the Cambodian Independent Teachers Union, there are 87,000 teachers in the country. Scores of teachers refused to work for a day or two in several provinces, although these protests were small and uncoordinated. Still, the demand highlighted the low salaries of educators which shocked and enraged many people. Meanwhile, trash piled up for three days in Phnom Penh early this month when more than 400 garbage collectors went on strike to demand $150 in monthly pay, a health bonus, and an overtime pay during weekends. The strike involved workers of Cintri, a subsidiary of the Canadian Firm Cintec, which signed a 50-year exclusive contract in 2002 to collect Phnom Penh’s trash. After several rounds of negotiations and days of mounting trash in the city, both parties came to an agreement. Street cleaners will now get $90 per month and truck drivers will receive $130. In addition, a health care center will be funded by the company. The uniform fee charged against employees will be scrapped. The labor strikes in the past two months revealed the degradingly low wages given to Cambodia’s workers. They also gave us a glimpse of the inhumane working and housing conditions of workers, which partly explains why they are easily persuaded by the agitation propaganda of various political forces. But with or without the backing of the opposition, workers have legitimate grievances that the government must quickly address. It’s unfortunate that instead of understanding the situation of workers, the government responded with violent impunity. Hopefully, the end of the strikes won’t stop policymakers and employers from looking for positive ways to improve the welfare of workers. The strikes may have yielded a slight increase in the basic pay for garment and garbage workers, but that pay is still woefully inadequate to meet the daily cost of living in the country. Continued increases in the cost of living, as recently lamented by some garment workers, Cambodia may soon face more protests and provocative actions from the labor sector. Premier hits out at critics who blame ASEAN's unprecedented failure to issue a joint communique in 2012 on Cambodia. Cambodia’s Hun Sen Threatens to Kill Opposition DialogueCambodia’s Strongman Taunts Opposition With Rocket FireCambodia Suspends China Dam Project to Silence OppositionCambodia Marks 30 Years Under Hun Sen’s Rule Amid Uncertain FutureCan Cambodian Deal End Year-Long Standoff?